Long before the Winklevoss twins unfriended Mark Zuckerberg, David Cronenberg introduced us to these scheming monozygotes — the gynegologist duo Bev/Elliot in Dead Ringers. We’re all fascinated by twins, whether it’s the charming movie of the same name with Messrs De Vito and Schwarzenegger, or the ditsy Vegas girls from The Bachelor. According to a study in the American Journal of Obstetrics and Gynecology, the rate of twin pregnancies in the United States is 32 per 1000 births in 2006. It’s rare, and it’s genetic, but it’s their use in nature/nurture studies that probably piqued Cronenberg’s interest, what with his background in the biological sciences. 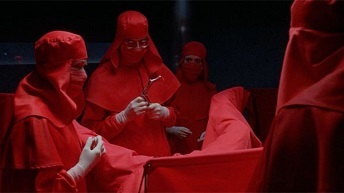 Like Cronenberg’s early horrors, Dead Ringers is a mutant movie, in this case, “mutant women,” treated by a team of twin brother gynecologists, the Doctors Mantle, who operate out of a high-tech Toronto clinic where their surgical team dress like Spanish Inquisitors in showy red robes.